Leonard's main area of research and teaching is in the field of control and dynamical systems, where she has made contributions both to theory and to application. The field involves designing and analyzing feedback and the behavior of complex, dynamical systems. In recent years she has focused on multi-agent systems in engineering (design of robotic networks) and in nature (analysis of animal and human groups) and mathematical approaches for leveraging insights across contexts. Her work examines the role of distributed feedback and interconnection in collective motion and collective decision-making. For example, she designed distributed feedback strategies for agents who respond to their neighbors and the environment to perform as a group in climbing gradients and tracking level sets in the sampled field as well as in realizing motion patterns that maximize information in sensor measurements. 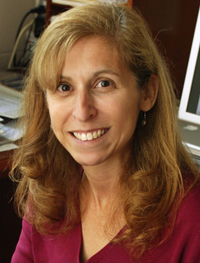 She has developed rigorous means to show how features of agent interconnections, such as network structure (e.g., who is communicating with whom), information heterogeneity (e.g., who is sensing what about the environment), and leadership structure, determine performance measures of collective dynamics such as speed, accuracy, robustness to uncertainty, and flexibility in a changing environment. She led a large, collaborative, multidisciplinary Adaptive Sampling and Prediction project on the development and demonstration, in Monterey Bay, CA in 2006, of an automated and adaptive ocean observing system consisting of a coordinated network of underwater robotic vehicles that move about on their own and carry sensors to collect scientific data about the ocean. She has collaborated with biologists to study the mechanisms that explain the collective dynamics of animal groups, including killifish, honeybees, caribou, and starlings, and to explain human decision-making under uncertainty. She is also engaged in work at the intersection of engineering and art. For example, in 2010 she co-created Flock Logic, an art-making project that explored what happens when dancers carry out the mathematical rules for dynamic response used to model flocking birds. Leonard is a MacArthur Fellow, an elected member of the American Academy of Arts and Sciences, and a Fellow of the ASME, IEEE, IFAC, and SIAM. She received the BSE in Mechanical Engineering from Princeton University, worked for four years as an engineer in the electric power industry, and then received the MS and PhD degrees in Electrical Engineering from the University of Maryland.